I was born in McKeesport, Pennsylvania on November 30, 1950. I was licensed KA3VHP in 1989 with the help of my first "Elmer", John Kirby, KA3ATQ. What peaked my interest in ham radio was shortwave listening. I would hear Morse Code and said, "one day I will know what they are saying," and now I do. I passed my General in 1990 and I was on my way. I am 100% CW and 99.9% QRP. The only time I am not QRP is when I meet with my code buddies. I am a member of FISTS -- my number is 1013. I have enjoyed that club for a number of years. I recently joined NAQCC -- my number is 1770. It has given me a new love for QRP and an excitement for the use of CW. I have always used simple wire antennas and will continue to do so. There is just something about using a wire antenna that you have made. 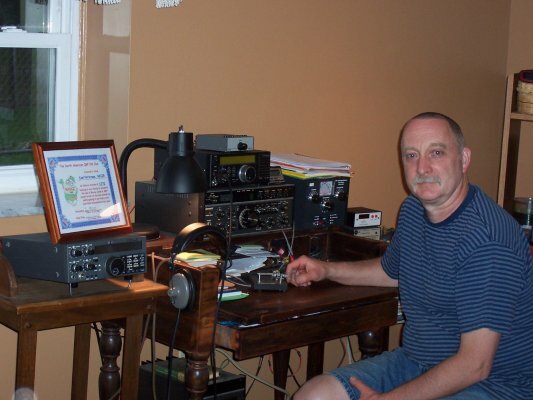 I have a number of TEN TEC Rigs courtesy of my second "Elmer" and QRP Master, Tom Creede, who is now a silent key, but will always be remembered by me as a great QRPer and CW man. My family includes my wife and best friend, Sharon, and my two sons, Jared and Adam. In the order of things that matter to me is first my relationship with God, then my family, then last but not least, amateur radio. I continue to learn more every day about all three of these.